When you are going through an addiction, you need adequate treatment from professionals who will care for you while providing the most effective treatment services possible. You can overcome this with the help of Bowers Recovery and our drug rehab centers across the country. After you come to terms with your condition as a chronic mental health issue, you will be able to go through our templated and structured addiction treatment program that will be completely designed around your needs and comprehensively altered to meet them. After you eliminate denial and come to terms with your condition, you will come to our drug detox clinic for supervised withdrawal. While your body goes through the process of eliminating any harmful chemicals that keep you dependent upon your drug of choice, you will go through some unpleasant symptoms. This is why we must work with you and watch over your progress carefully in order to empower you to get through this and move on to long-term therapy at one of our addiction treatment clinics. The next thing you will do is attend therapy with a personal counselor. 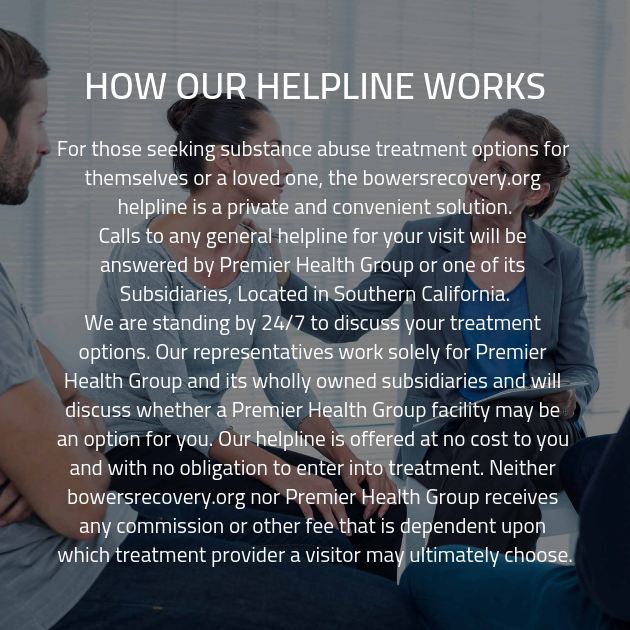 Here you will work with the therapist to create your customized and comprehensive addiction treatment plan that will guide you through the rest of this process. You will share your story and get screened for any underlying dual diagnosis mental health issues. While being treated accordingly, you will learn how to express yourself and receive advice from a professional. Then you will attend group therapy sessions where you will work your peers and find solutions to your problems. Together the group will share their struggles, listen to each other, and exchange invaluable advice on how to avoid triggers and deal with cravings. Call Bowers Recovery to get started today. You won’t regret the day you changed your life forever.